Coastal rainbows (“Oncorhynchus mykiss irideus”) are native to the north Pacific coast, from northern Mexico to Alaska, and across the Bering Straight to eastern Asia. Within CONUS, the coastal rainbow trout’s original range was restricted to areas west of the Pacific crest mountain ranges: the Sierra Nevada or Cascades. Interior “rainbows” were originally various redband variants, e.g. Columbia Basin Redbands (O. m. gairdneri) or Great Basin Redbands (O. m. newberrii). Rainbows have a sleek, streamlined shape, adipose fin, and soft-rayed dorsal fin. 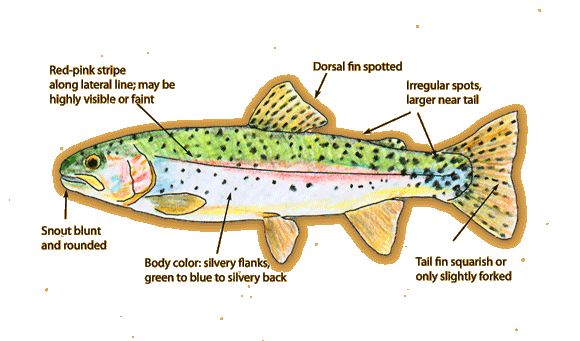 The rainbow can be distinguished from other salmonids by the presence of small dark spots dorsally, and on the entire caudal (tail) fin. The upper half of the body is often a dark olive or steel blue color but this can be highly variable. The rainbow often has a pinkish-red lateral stripe on the sides and similarly colored gill covers, though this can sometimes can appear nearly silver when the trout are not spawning. Males are generally more colorful than females and, during spawning, often develop an elongated jaw and snout that curve in at the ends toward the mouth. Sea-run rainbows are known as “steelhead”. Coastal rainbows were stocked in the United States as far back as the 19th century, and are now the most widely distributed wild trout species in the world, from Europe to New Zealand (where they are exotics). Today, rainbow trout are found in a high percentage of American waters with suitable trout habitat. They are more tolerant of warm water than most trout, and are now found wild in every state of the US that support wild trout, and inhabit more streams than any other species, out-competing natives. Often, Rainbows share many of the same streams as Browns (an exotic trout everywhere they are found in North America, being Native to northern Europe). Browns will often dominate the streams if the water provides plenty of cover with undercut banks. Rainbows will dominate if the stream has defined channels and a medium to fast current. Only when the streams have a complexity of habitat desirable to both will they coexist. Because Rainbows spawn in the spring along with many native cutthroat and redband species, they often hybridize. “Cutt-bows”, depending on the genetic composition, will often share many Rainbow characteristics, with the distinctive cutthroat slashes under the jaw.